It's that time of the year where we start afresh and make plans and goals for the new year. Which might be useful to have a discussion about WILL POWER. This year, I'm introducing a planning and goal setting program, which is online, and it discusses the steps to get you organised. So, it very poignant to perhaps talk about News Year’s Resolutions, Goal Setting and the link with motivation and willpower so we can continue our good intentions throughout the year. Typically, we see a considerable decline in our plans after the first month and if you’re lucky you will still be going in February, then we tend to start losing motivation and sight of our goals. Firstly ‘what is willpower’? Willpower is basically the ability to resist short term gratification or temptation for long-term gain. There has been lots of research on this topic with most people having heard about the experiment that was done with young children and the marshmallows, if not here is the link (https://youtu.be/QX_oy9614HQ). These children were followed throughout their lives and the study concluded that those children that were most successful in life were the ones that were able to delay gratification. Willpower is like a super power and it can be strengthened, and it also can get depleted. It is similar to a muscle that gets fatigued short term however strengthened long term. The best part about willpower is that typically it is never completely lost, because that's when you lose hope. So, if you still have hope you still have will power. How do you top up or strengthen your will power, so you can continue to achieve or maintain your New Year’s Resolutions? 1. Stress Management - The number one thing that I think depletes Will power faster than anything is not managing your stress well. It is exhausting mentally and physically to be in a state of constant ‘fight or flight’. 2. Organisation and Planning – Having a plan that is meaningful to you which means it is aligned with your values. 3. Role Model or a Mentor – Someone that you refer to for inspiration and ‘hope’ when your willometer is getting low. In my Planning Program I call this your Brain Trust. 3. Setting up a Habit – Take the pressure off your mind by setting up some good habits as this will free up a huge amount of time and energy. 4. Sleep – Sleep is a vital part of maintaining willpower, if sleep is an issue seek out some solutions or see your GP to rectify – everything appears clearer after a good nap. 5. Meditate – Turn your mind and body down a notch or two and gain clarity. 6. Ownership of your Goals - knowing that you and you alone are the only one who can make them happen. If you own your where you're at, and why you're there, how you got there and take responsibility for it you will increase willpower. 7. Believing - that you have lots of willpower, believing you have resources and resilience is also another way to increase your willpower. Knowing if you have hope you have willpower. I hope this helps you stay on track this year and gets you one step closer to living the life you know you deserve. It's Christmas time! That time of year that can be either blissfully happy or incredibly stressful. It’s also the time of year where we tend to see people be just that little bit kinder and more respectful to others. If I had my way I would make this ‘Christmas spirit’ continue for 365 days of the year. Not only does it make us feel better but research supports that developing an ‘attitude of gratitude’ can increase happiness, reduce depression and strengthen resiliency. Researchers such as Bruce Lipton’s have given us an insight into epigenetics, which is the study of changes in organisms caused by the modification of gene expression rather than alteration of the genetic code itself. Lipton’s research discusses his manipulation of environments that gene cells are in, leading to different outcomes to the SAME gene. Further stating that by simply changing the environment that the gene is in changes the outcome of the gene expression. Leading to the debate that we have more control than we originally thought over our own health and projection in life. This type of research goes onto discuss the impact on an ‘attitude of gratitude’ on a person's brain. Giving us proof that grateful people experience reduce blood pressure, less chronic pain, have increased energy levels and even live longer lives. Hi, my name is Arizona and I work with all the great clinicians at Drop of Life Psychology Clinic and here’s my little take on stress for Stress Down Day (24th of July). I will admit, I experienced stress while completing my degree but nothing seemed to compare to the stress I felt upon graduating and the actual completion of my degree. You’re probably wondering why and to be honest I was as well and it wasn’t until much later, when I looked back, that I even realised myself. As soon as I had lost my identity as a student I thought “who am I now” and to make it worse the constant questions of “what are you going to do now” made me feel lost. It wasn’t until a wise book (The Easy Guide to Unbreakable Relationships for Self, Lovers and Others by Natalie Turvey) once reminded me what I valued about myself and brought me back to those values. Step 2: Rank those qualities in order of importance to you. Do some of them not serve you well? Are there some you can move away from? Step 3: Look at the list, identify any qualities you haven’t been displaying lately and take action. What can you do right now to bring you closer to these values? In the chaos of university you grow, evolve and it’s definitely a period of change and I think once it’s all over you struggle to identify yourself and nobody really prepares you for that. I am no longer a student but that’s not all I valued. Turns out I valued so much more than I had given myself credit for and once I had realised what I valued and became a little bit more confident which in turn helped me get a job that brings me even closer to what I value every day. I hope this blog makes you value more of what is important to you and even who you are as a person because you are important, to more people than you could probably even realise. I might start by explaining what EMOTIONAL INTELLIGENCE (EI) is and why it is important. It is often talked about as a bit of a buzz word however it is incredibly important to how we function. Emotional Intelligence (EQ or EI) is a term created by two researchers – Peter Salavoy and John Mayer – and popularized by Dan Goleman. Basically EI is a person’s ability to feel an emotion, identify and label it, then know how to manage it. Big call right! Typically, we have learned this valuable skill in our youth when it was modelled to us by our family and loved ones. So, in true developmental stages, a young child will start to form some level of EI, which means that they can identify and label their emotions correctly. They will start to form these ideas by seeing, feeling and hearing what their parents do and how their parents narrate their behaviours and feelings. Babies get a ‘get-out-of-jail-free’ card and are allowed to scream with pleasure or howl with anger. However, hopefully, as we develop and mature, we learn to curb these extreme emotional responses. Thus allowing us to blend into our environment a bit more. Everyone is usually aware of the term IQ, which stands for your intellectual quotient and that’s our ability to learn, and it remains relatively stable over time, believe it or not. EI is different to IQ, because it’s not about our intellect but rather, it’s our capacity to recognise and understand our own emotions and those of others. Unlike IQ, EI is not set in stone; it is flexible and can be developed. It’s a set of skills that can be acquired and improved on with a bit of practice, which is why it is useful to see a professional if your emotional intelligence is lacking or if you don’t think you do emotional intelligence well. There’s no known connection between your IQ and your EI. You simply can’t predict emotional intelligence based on how smart someone is. Although I firmly believe that some people are naturally more emotionally intelligent than others. So the burning question is how much impact does EI have on someone’s professional success. The short answer is A LOT! The reason being that this skill has been researched and tested in conjunction with other psychometrics that predict and assist performance. The results are that EI is the strongest predictor of success and performance in the workplace. The reason is that it holds the foundation of the core skills that we do (or should do) every day. Things such as Decision-Making, Time Management, Stress Tolerance, Anger Management, Empathy, the ability to work within a team, your ability to communicate well hence effecting Team Work and Social Skills. It is also responsible for Assertiveness and the ability to motivate yourself and persist in the face of failure or rejection. The statistics state that 90% of top performers in business have solid EI and this result remains true across all industries. As mentioned EI is a skill that can be strengthened by training your brain to build those neural pathways by identifying and labelling emotions and feelings in the body and in those around you. Start practicing you may get a promotion out of it! Christmas is now upon us – Kindness Matters! It is interesting, as I grow older and wiser, and my children have partners and lives of their own, I find that Christmas feels different! When I had a younger family and we were all under the same roof it was financially difficult because of the expectations around gifts and the season events. However that was offset by the thrill of Shopping centres and Christmas carols which excited our little family and made the season come alive. Now that it is only my husband and I in the house and no grandchildren as yet!! This time of year is more about my relationships and slowing down to feel connected with those that I choose to be in my life. This leads me to feel like there is so much more about this time of year than gifts and the commercial side of things. In the clinic our monthly competition has changed to a challenge!!!! (should you choose to accept). We have borrowed a 'Kindness Calendar' which has something very small every day that I challenge everyone to do. The gift of giving is not only around presents, it is also about the ability to give of yourself to others without any sense or feeling of reciprocation. It's doing something simply because it feels good and costs nothing, but to someone else it may be everything! I remember one year a very long time ago when I was in hospital with my youngest who was very unwell and had spent years in and out of hospital. I had a school mum come to the hospital and simply arrive with no other agender than to give me a hand massage and manicure which she did then left. It was such a simple gesture and so very kind, and to this day almost 18 years later it still sits with me as one of the kindest and most unselfish things someone has done for me. It saddens me that most of us only stop this time of year to think consciously about giving to all, I have no doubt that you are doing kind things often, however how often do you stop to make a conscious choice to change the way you act and treat others? How often do you stop and ask, is there a softer way to say that so it is heard by others and not reacted upon? What is one small thing that I could do to make someone elses life easier/happier? Challenge number 2, slow down and be aware during this month of your interactions, of your words and most importantly of your stress levels. I have enjoyed tremendously working with you all this year and sincerely hope you have a relaxing Christmas filled with love and wonder. 1. EXPLOSION OF NEURAL PATHWAYS - Right before puberty the brain is blossoming and there is an overabundance of neuronal connections, so this now becomes a critical period of development. This structural reorganization is thought to continue until the age of 25, which is probably just as well given some of the experimental experiences they get up to eg drinking to excess, drugs etc. 2. PHYSICAL DEVELOPMENT - The most obvious is the awkward growth spurt, and physical changes that occur. It sometimes looks like teenagers themselves cannot control their bodies, becoming clumsy and not realising their new found strength. Puberty is the beginning of major changes in the limbic system, meaning among other things there is a change in the circadian rhythms (which are physical, mental and behavioural changes that follow a roughly 24 hour cycle) this looks like the teen sleeping in and going to bed later. Which means they start to rack up sleep debt!!! This is really bad because sleep is thought to help reorganise the teenage brain. As we all know sleep deprivation leads to an exacerbation in moodiness and cloudy decision-making!! The hormone changes at puberty have a huge affect on the brain, one of which is to spur the production of more receptors for oxytocin, (bonding hormone). This may result in an increased level of sensitivity and leading to feelings self-consciousness, making an adolescent truly feel like everyone is watching them. This may make a teen seem self-centered (and in their defence, they do have a lot going on). 3. IDENTITY – forming and storming their identity - Teens have this overwhelming urge to figure out who they are and what they believe and stand for. This is often formed through their peers who become VERY important throughout this stage. They will experiment and work out with the different groups what they do and don’t like. Parent s and other role models play a role too. 4. NEW THINKING SKILLS – As mentioned now we have lots more brain development to access, so it will start to interconnect an gain more processing power. So they START ..not there 100% yet ..to access more complex decision making skill. So for awhile this does not always work out for them. Based on the stage of their brain development, adolescents are more likely to: #Act on impulse, #misread or misinterpret social cues and emotions, #get into accidents of all kinds, #get involved in fights, #engage in dangerous or risky behaviour. AND LESS likely to: #think before they act, #pause to consider the consequences of their actions, #change their dangerous or inappropriate behaviours. Which leads us to - DECISION MAKING PROCESS! – The teenagers newly found emotions and brain development tend to affect their decision making processes. This will mean that their decisions can be overly influenced by their emotional part of the brain (limbic system) rather than our more rational prefrontal cortex. This will often leave a lot of adults around them going…’what the!’ as they will do silly things like drive too fast, drink and drive, punch walls/jump off high things and hurt themselves, when they clearly know better. Basically cause and effect is hindered, as the teenage brains is simply put wired to seek reward making them vulnerable to engaging in risky behaviours. According to many researches by late adolescence, say 17 years on, the part of the brain responsible for impulse control and long-term perspective taking is thought to help them reign in some of the behaviour they were tempted by in middle adolescence. PHEW! 5. SOCIAL – As mention we have this Hugh amount of brain development and skills which the teenager is still trying to figure out how to work with. I like the analogy of when you get a new cadet, you kind of just experiment with it until you figure it out… well that’s our teenagers in a nutshell!! This is why teenagers need to experiment with new situations, friendships and challenge pretty much everything. In most cases teenagers will try this out with their parents (as it’s a safe environment – meaning you will love them anyway, most of the time!) and NOW we have parent child conflict to add to our mix of chaos. Conflict becomes like an experimental ‘self expression’ if you will, this is even more complicated by the issue of the ‘Ego Centric Brain’ meaning it can be difficult to understanding another’s point of view. again parent child conflict! So as hard as this might be to believe this behaviour is not actually a personal thing. Keep in mind that we need to be the bigger, stronger and wiser person, so as to help them to stay calm, listen and basically be good role model. We need to show them HOW we want them to behave. They need to learn and practice how to develop those underdeveloped abilities. Until these areas are fully developed there is the possibility of them misreading teachers, parents and others. Just a little word to the wise - The more you yell at a teen, the worse they will likely behave, often not matter how careful you are there is always the possibility that it will end in tears or anger because they will have misunderstood what you have said, … Its tough, dammed if you do and dammed if you don’t. 6. INDIVIDUATION - One of the jobs of a teenager is to start to separate from their family and establish some autonomy, both emotionally, physically and financially. Don’t worry just yet because they still need their parents to provide them with the well needed stability and structure. So even when your 15/16yo is trying to act like an adult and do adult things if you treat them as an adult you may be setting them up unfairly for failure in the future. They still need you even if they say they don’t. One of the BEST ways to parent your teen, other than being reliable, predictable and a good listener, is to be a good role model, especially when dealing with stress and other tough life events. The teen is trying really hard at this stage to figure our their own way of coping and they are always watching you. "It is the first time they are seeing themselves in the world," meaning their greater autonomy has opened their eyes to what lies beyond their families and schools. They are asking themselves, for perhaps the first time: What kind of person do I want to be and what type of place do I want the world to be? Our job as parents is to help them explore the questions, rather than give them answers. This month is the start of Autism Awareness Month in Australia and Autism Queensland's annual Go Blue for Autism campaign. In my research to do a blog on this topic, I came across an article which looked at Asperger syndrome completely differently and it made so much more sense to write about it in this format than in the typical diagnostic format. The majority of people have some idea of Asperger syndrome, and if not they can certainly reflect on the characteristics of Sheldon Cooper from The Big Bang Theory. Just to refresh your memory, Sheldon plays a scientific genius who works at a local university and shows several characteristics typical to those who have Aspergers, such as attention to detail, repetitive actions and a lack of social skills. I realise that I am just postulating on whether or not the Sheldon character has Aspergers, regardless the show’s popularity has brought a level of tolerance and appreciation for Sheldon’s character. I have to admit that I love and watch The Big Bang Theory and am quite fond of Sheldon’s character. One of the biggest reason why people seem so drawn to Sheldon is that he comes across as absolutely brilliant. The characteristics that I love about him is he is who he is and doesn’t pretend to be someone he isn’t. He’s just his own unique self! That is something to admire. There has always been speculation around other prominent figures, and recently self-advocate Dr Temple Grandin mentioned that she believed Steve Jobs and Albert Einstein shared characteristics of Aspergers, Much like Sheldon, these two geniuses are seen as brilliant minds that also have issues with social interaction. Sheldon, Steve Jobs and Albert Einstein show us that anyone with a dream, with or without a diagnosis of Asperger's can aspire to obtain a job you love, be in a healthy relationship and live an independent life. These people show us hope that this can become a reality. Even though Sheldon may seem different, anyone with a profile like his should be treated with respect and tolerance. Because the wide spectrum of autism includes many truly unique individuals. Their stories should be celebrated much like those of Sheldon, Albert and Steve. Here’s the big, untold story. From the beginning of a relationship, from the very first smoulderingly hot glance and the stirring attraction that the right woman will generate in a man, how a man understands a woman’s emotions and responds to them will determine everything in the rest of his life. That’s the bottom line. How will you know if she is the one? One of the major hormones of Limerence is oxytocin, the cuddle and bonding hormone. Oxytocin makes men feel close and safe with a woman. It shuts down our brain’s fear centre. It is also the hormone of very bad judgment, so we discuss how to see the red flags that tell you that you’d better bail out. How can conflict become constructive? The answer is to avoid the Four Horsemen – Criticism, Defensiveness, Contempt, and Stonewalling. This book will help men to recognize when they’re getting physiologically flooded, because when your heart rate exceeds 100 BPM, you can’t listen well, you lose your sense of humour, you can’t be creative, and you can’t empathize. You are physiologically unable to hear what your partner is saying. What does commitment get you? The answer may be found in the research of University of Virginia psychologist Jim Coan, a former student of mine. He put a happily married woman in a functional MRI tube where she randomly received a mild electric shock 25% of the time. If her husband held her hand, the fear centres in her brain shut down completely. They lit up if a stranger (or if no one) held her hand. Jim then did the experiment on gay and lesbian couples with the same results. Commitment provides safety and the ability to soothe one another just by holding hands during a scary event. That’s quite a benefit! 95% of women will become parents. Part of the growth that most men will go through is becoming a father. This book explains the astounding importance research has revealed of dads in their children’s intellectual, emotional, and physical well being throughout their lives. Learn about John Quinn, who started it all by handcuffing himself to his wife as she went into labour. At that time, almost zero percent of dads saw their babies born – today 91% of dads are there to see the birth of their child. Becoming a dad hugely amplifies a man’s ability to love. Loving a woman for a lifetime means continuing courtship and never taking it for granted. Learn what science has now revealed how to affair-proof your. The study that I thought I would discuss is the one that looks at how we conform to the nom. This is repeated over and over again in our society especially when we are bombarded by the news and others opinions. The study by Asch, 1951and several more after him shows that the majority of the population (identified by the sample group that represents the population) will deny their own sense of judgement just to conform with others. We all know that humans as a whole will copy each other’s dress sense, ways of talking and attitudes, often without a second thought. However it’s very interesting how far our need to conform goes. They were asked which of these three lines was the same length as the single line on the left? The answer is quite clearly C. However this study found that 76% of people denied their own judgement at least once, choosing either A or B. The fascinating thing about this experiment was that its creator, renowned psychologist Solomon Asch, set out to prove the exact opposite. A previous experiment by Muzafer Sherif (see his well-known Robbers Cave experiment) had found that when people were faced with making a judgement on an ambiguous test, they used other people’s judgements as a reference point. This makes perfect sense, typically when we are not sure about something, we will check with someone else, but usually ONLY when you are not sure. This situation is quite different the answer is quite clear so WHY is this so!!!! This is how this experiment was conducted and repeated over and over again. Male undergraduates were brought into a room one at a time, with eight others who were supposedly fellow participants. These young men were shown the above picture of the three lines. 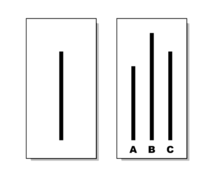 All of the participants were asked to call out which line – A, B or C – was the same length as the reference line. This procedure was repeated 12 times with participants viewing variations of the above figure. What the young men didn’t realise was that all the other participants were in on the experiment, they had been asked to give the wrong answer. The young male undergraduates were the sixth in line to give their answer. Surprisingly they found that 50% of people gave the same wrong answer as the others on more than half of the trials. Only 25% of participants refused to be swayed by the majority’s blatantly false judgement on all of the 12 trials. 5% always conformed to the majority incorrect opinion. As I mentioned this experiment has been repeated over time over and over again and over all the trials the average conformity rate was 33%. Intrigued as to why participants had gone along with the majority as you would be! The participants were interviewed after the experiment. Their answers are probably very familiar to all of us: All felt anxious, feared disapproval from others and became self-conscious. Most explained they saw the lines differently to the group but then felt the group was correct. Some said they went along with the group to avoid standing out, although they knew the group was wrong. A small number of people actually said they saw the lines in the same way as the group. Back to my question of WHY? While there’s no surprise that we copy each other, it’s amazing that some people will conform despite the evidence from their own eyes. The research states that those who are ‘conformers’ typically have high levels of anxiety, low status, high need for approval and often authoritarian personalities. People from cultures which view conformity more favourably – typically Eastern societies – are more likely to conform as well. Conformity itself is something of a mixed blessing, because in many situations we need conformity, life would be chaos if we didn’t have some level of conformity such as abiding by the law, social norms, queues etc. The dangers of conformity however are only too well-known, just take a look at Hitler for a start. It does make you think how our own lives would be different if, one day, we decided not to conform, or even to suddenly start conforming. Would things get better or worse for you? Many people find their inability to conform is a real problem in their lives while others find it more difficult to break away and do their own thing. CHALLENGE - I would like to set a challenge for those who are reading this to try really hard to think for yourself rather than relying on what others say and do. Gather information from a variety of different sources to form your own option. GOOD LUCK and remember to be kinder to yourself than anyone else can be. The term ‘Depression’ is used to describe feelings and experiences. To majority of the population being depressed basically means that you are feeling down, sad, or upset. However, it is important to distinguish depression from sadness because a person can feel these emotions without being ‘clinically' depressed. The big difference is that normal feelings of sadness are generally brief and do not impact on your day to day functioning. You can still go to work, go out with friends while not feeling amazing and ecstatically happy you can still get on with your normal functioning. Depression has become so common that it is often referred to as the “common cold” of mental illness. Approximately 12 out of every 100 people globally at any given point of time are undergoing an episode of depression. Have you ever endured a day where absolutely everything’s went wrong.. You kicked your toe getting out of bed, the hot water run out during the shampoo cycle of your shower, the milk is off, which you only realised after your first mouthful of cereal, you caught every red light red light on the way to work and so on and so on so that it literally feels like it will never end. In a way being depressed is slightly similar to that horrible day where everything keeps going wrong except there is NO break in the cycle. Which leads to feelings of hopelessness. When a person is depressed, they may not feel they have enough energy to get up from bed or do any of the daily routine that we tend to do without too much effort. They feel tired ALL the time have difficulty concentrating on work/study or other activities. There sleep cycle is interrupted or changes either sleeping too much or not enough. They eat poorly and gather no joy from any activity or anyone. Sometimes it impacts so much on them and their life that they are unable to take care of themselves and yet feel too ashamed of asking for help, worrying about judgement or criticism. The big factor is the insistent internal voice that is constantly running them down bringing all past events under the microscope to ridicule and judge them thus impacting on their confidence and self-esteem. It is very important that people who feel depressed or who think they may be depressed understand what depression is and how to move through it. It is very easy to get swept up in this mood but it is most important to remember is that it is not your “fault” or “weakness” that you are depressed. Nor can you just “snap out of it” as most friends/ relatives/ well-wishers will suggest. It helps to talk to someone so you can process and understand the chaos that you are feeling. Regrettably most people do not seek treatment and end up suffering. Depression is not permanent – there are number of psychological and pharmacological treatments (antidepressant medication) that are effective, affordable and readily available. Modified from Dr Lauran Kastner book ‘Getting to Calm’ she is a very cleaver lady and one of my favourite work authors. When kids hit the teenager years and the preteen years it’s a HUGH transition for most parents. Our children begin to be heavily influenced by their peer group and that often makes things difficult with the rules of our households. One the hardest things during this time is that as parents we lose our children automatic respect and we have to start earning it! YIKES Lets be honest when they were younger all had to do was turn up and they thought we were great. Our old style of parenting with punishment to control our children’s behaviours (including timeouts and consequences) is no longer working. In fact, most of the time we are really not too sure what they are up to when they are away from us. Our job as parents is to lay the groundwork so that our children know right from wrong and start to act on it. Part of that groundwork includes a strong parent-child relationship so the child really does not want to disappoint us and WANTS to cooperate. It also includes teaching our children how to gains the ability to regulate their emotions, which lets them regulate their behaviour. Believe it or not research tells us that children who are lovingly guided to make amends and solve problems, are the ones who develop their internal discipline and gain a strong moral sense. Basically that means for us as parents to be respectful, give positive guidance right from the beginning. That raises our youth to be respectful, considerate, responsible, self-disciplined and delightful. (Just like us  ). 1. Agree with your child on non-negotiable family rules. No 1 - Talk in a respectful manner, Establish household RULE that is enforced by everyone. Kids lose respect for parents who yell because let’s be honest if your yelling you have lost control of your own emotions. . There shouldn't be many of them, stick to the important stuff. We need our kids to be involved so they have a sense of control and ownership of their behaviours. 2. Strengthening your relationship with your child so that when you set limits your child actually wants to co operate because of the relationship, not because of what you are asking them to do. To strengthen your relationship you need to make one-on-one time with them. During this time its quality time over quantity therefore do not talk about subjects that you know cause an issue. The purpose is to strengthen so enjoy each other.. listen to their music ask WHY they like it (because good chance you wont) Physical touch works wonders try a should massage or tickle their back/hair. If your child doesn’t enjoy being with you then you cannot hope to influence them. 3. No more Cotton Wool parenting allow them to experience natural consequences. When we worry about our children and FIX things for them we protect them from natural consequences. Eg Did not hand in their permission slip for the class trip, they will learn an invaluable lesson if you don't rescue them. 4. Stop punishing. OOOOH yes this one always hits a chord…. We need our developing adults to learn about self-discipline this will develop when they start to CHOOSE to give up what they want for something they want more. What do they want more? To follow your lead and have a good relationship with you. So focus on the relationship instead of punishment. 5. Focus on teaching your child to repair their mistakes. Worried that your child isn't being "held accountable"? Introduce the concept of reparations. This isn't a consequence (punishment) that you impose. This is when you ask your child if there's something he can do to make the situation better now. For instance, if he says something mean to his sister, he'll need to do some repair work on that relationship. If he breaks something, he'll need to help pay for a replacement. But remember that if you think up the reparation and force it down his throat, it only makes sense that he'll reject it. Instead, let this be an empowering opportunity for him to learn that we all make mistakes -- and we can always take action to make things better. THEN help them to repair their mistakes. Let’s face it they are going to make a few over this time!. So teach them to start to repair it themselves so they are "held accountable" . This is when you ask your child is… there's something he can do to make the situation better now. They will need to do some repair work on whatever went pear shaped, don’t FORCE them to DO IT instead create an opportunity for them to learn that we all make mistakes -- and we can always take action to make things better. 7. Be kind but firm. It’s an absolute GIVEN that your child will test the limits just to make sure you are serious! Stay Calm and be consistent. How to teach your kids EMOTIONAL INTELLIGENCE! In my practice I beg and borrow information from my learning and experience and bring it to my practice. To tease out years and years of knowledge is tough so I’ll start with the disclaimer that some is mine and some is other people’s information and learning. Emotional Intelligence is very basically the ability to IDENTIFY AND LABEL (see hear feel remember) your emotions and those of others. Example; I feel sad (labeled it) I know I’m sad because I can see my body language with my shoulders slumped my head hanging. I can (hear) the sad words that I am saying and I (feel) tired, with a pain in my stomach and tears running down my cheeks and that nothing seems to be ok. I (remember) being in this mood before and I felt irritable and touchy and people go upset with me. Example of Others - Tom is Sad, I know he is sad because he is saying (hear) sad words and I can (See) him crying with his shoulders slumped and head hanging. I can (Feel) it when I’m next to him that I feel a bit sad too and I (remember) feeling the same way too once before when my I go in trouble at school. When you have good emotional literacy you are able to harness these emotions and apply them to tasks like thinking and problems solving; Well I know I’m sad because I did not do well in my math’s assignment and that feels bad. So “what do I have to do now” to do better next math’s assignment, well I could go home and read over the mistakes and learn what I did not get right. You also need to be able to manage that emotion to problem solve how to cheer up or calm down another person. Well I know I always feel better when I listen to my favorite band or when I ring my best friend and talk about what we will do on the weekend. Others I know Tom is sad and it would make him feel better if I went and sat with him and asked if he was ok and then asked him to play with me. As parents we need to embraced it as a parenting concept so we can teach our children how the emotions we feel impact on what we do, what we think, the decisions we make, how we interact with others. When we can understand this concept we can be more proactive and better at whatever we want to do. I have a bunch of cool tools to help you and your children monitor and understand how to establish or maintain this process.